Anyway, Dirty chips are kettle style, crispy and oily. They offer some standard flavors (salted, bbq, sour cream and onion, etc), but also some more exotic ones like maui onion. They are all fine, but nothing special. Meh. I'm still continuing my quest to find chips I love. Cracked Pepper & Sea Salt. Tasting notes: Eww. Now, I would have never selected these, Ojan got them for some reason. They were good standard oily crispy kettle chips, but I really did not like the pepper. Maui Onion. Tasting notes: Kinda sweet onion flavor. Good crispiness. Mesquite BBQ: Tasting notes: Same good crispiness, decent sorta sweet mesquite flavor, but not my favorite. Sweet Potato. 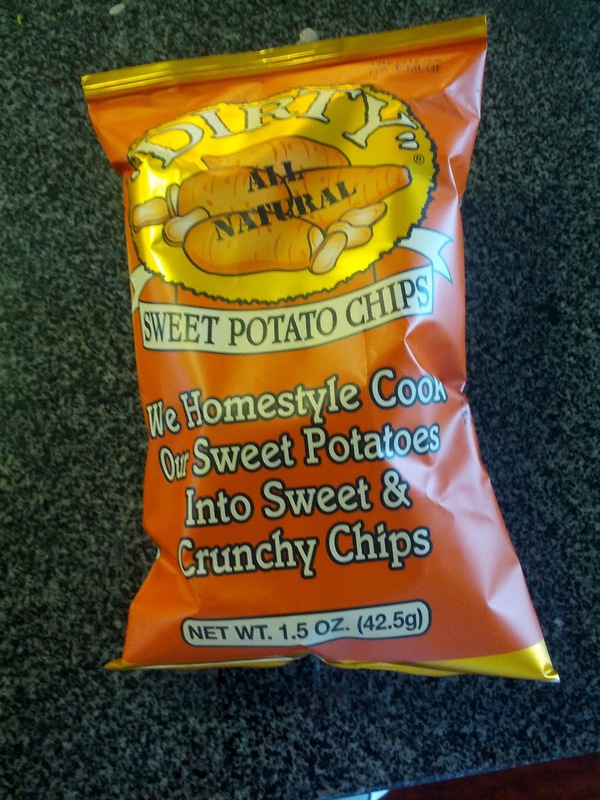 Tasting notes: Very sweet potato flavored, crispy, but something just seemed to be missing. I didn’t like them nearly as much as Terra or Food Should Taste Good ones. I was thrilled to discover that Soup Junkie was added to GoPago since the last time I went on a GoPago donut adventure, since they carry Dynamo Donuts. I've still never had a Dynamo donut, but everyone tells me they are the best around. My previous two donut adventures led me to understand that donut eaters somehow get up crazy early and deplete the stock of all good donuts very early, so I got an even earlier start. I pulled up GoPago on the way to place my order, and was horrified to see that Soup Junkie was listed as closed. Hmm. I still headed there, hoping that their machine was just off, and that I could tell them this, and they'd turn it on and I'd get my sugary goodness. As I approached, I saw that they were indeed open. Phew. But ... as I got closer, I saw that the donut case was empty. Only cookies remained. Foiled again! So, I decided to try my luck at the last place I got a donut on GoPago: Henry's Cafe and Deli. My last donut there had been a bit unremarkable, but I did just get a simple glazed donut, which isn't what I would have picked given more options. I rushed there, not placing my order in advance, just in case they had a poor selection. When I arrived, the selection was minimal, but this time it had a huge, awesometastic looking apple fritter. Yes, please! In the GoPago app, "small donut" was listed as $1, and "large donut" was $1.50, so I assumed it was a "large donut". I placed my order, the signature GoPago chimes sounded, and the person working asked me which donut I'd like. I pointed to the fritter, and she informed me that that wasn't a donut, it was an "apple pie", and it was $2. I said I'd change my order, as I wanted the fritter, but "apple pie" wasn't anywhere to be found on the menu. Nor was anything else that was $2. Sigh. I tried to communicate the problem, as I didn't actually have cash on me, and using a credit card to pay the $0.50 difference seemed ridiculous. She was really helpful, and suggested that I select another $1 donut, and that she'd just give me $0.50 change. Problem solved. A bit of a frustrating ordering experience, but I should have asked before I placed my order. Not GoPago's fault at all, but if you want to order a fritter, you can probably best do so by ordering 2 "small donuts". I barely took two steps outside the door before I tore into my fritter. I almost didn't bother taking a photo, but this beast needed documentation. Sadly, my first bite was met with disappointment. It wasn't moist. Nor did it have a crispy exterior. And it was really, really fried tasting. I remembered feeling that way slightly about the last donut I'd had from Henry's, but it was really extreme in this case. So much oil. I tried a few more bites, and then realized something else was wrong too ... where were the apples? I think I found one tiny bit in the entire thing. Not only was it not an apple fritter like it looked like, but it surely wasn't an "apple pie". There was a little bit of cinnamon between the dough bits, which was a nice surprise, perhaps the only redeeming quality. While it was coated in glaze, even that part somehow wasn't sweet or delicious. 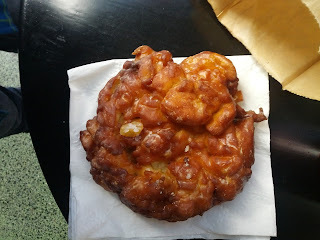 The fritter was huge, like any good apple fritter. $2 seems even a bit cheap compared to prices I've seen other places for fritters. But I certainly wouldn't get another. As you know from yesterday's post about my failed fish and chips, I spent last weekend up in Tahoe. For part of the trip, I stayed at the newly remodeled Hyatt Regency in Incline Village, NV. The property was amazing, with beautiful outdoor heated pools (with swim-out access! ), hot tubs, fire pits, a casino, etc, etc. I visited in the winter, but it looks like a great place for summer as well, with a location right on Lake Tahoe. The guest rooms were all renovated and I loved the rustic yet upscale decor. I had a great stay. "But Julie, why are you writing about a hotel, this is "Julie's Dining Club", right?" Well, yes, although Ojan told me I should start reviewing hotels, as you can guess, I have opinions on them too! Anyway, included in my hotel package was breakfast at one of the six (!) dining establishments on the property, Sierra Cafe. We visited twice: first for the buffet, and once for the a la carte menu. I failed to take photos during my buffet visit, as I was so excited about all my choices, but I did take notes. I also failed to take photos of half the stuff I had on my next visit. What a bad food blogger I am! (actually, I wasn't planning to write up any of the places I went in Tahoe, but Ojan convinced me that some of you loyal readers might be interested ...) The buffet was actually quite impressive, and I'd get it again in a heartbeat. The a la carte menu however was really not very good at all. I don't recommend anything from it. 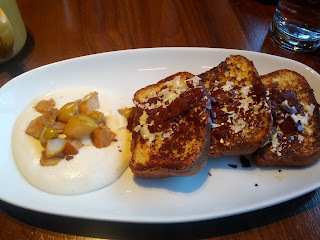 White Chocolate French Toast: Roasted apples and pears, whipped cream. $14. I love, love, love french toast. The moment I found out I was going to Sierra Cafe, I pulled up the online menu, and I knew I was going to order this dish. Unfortunately, it was a huge letdown. The french toast was 3 slices of plain, slightly brioche-like bread. It wasn’t custardy at all, nor crispy on the outside. Really, just seared bread that was very oily. It had absolutely no flavor, and I wouldn’t have known it was custard soaked at all. It also had zero spicing. On top was some shaved white and regular chocolate. The french toast was barely warm, so it didn’t melt, and just remained solid on top, and I was unable to spread it around. Meh. I was surprised to see the regular chocolate, as it was described as "white chocolate french toast". On the side was apparently some roasted apples and pears, although I couldn’t really identify them as such. Mostly just cold, flavorless mush. I kept eating them, wanting them to add something to the dish, but they didn’t. There was also some cream-like substance. It said whipped cream, but I really don't think it was. Not fluffy. Not whipped. Really strange mouthfeel. It seemed slightly spiced, but I couldn't identify with what. This was just really, really not good. Would not order again. 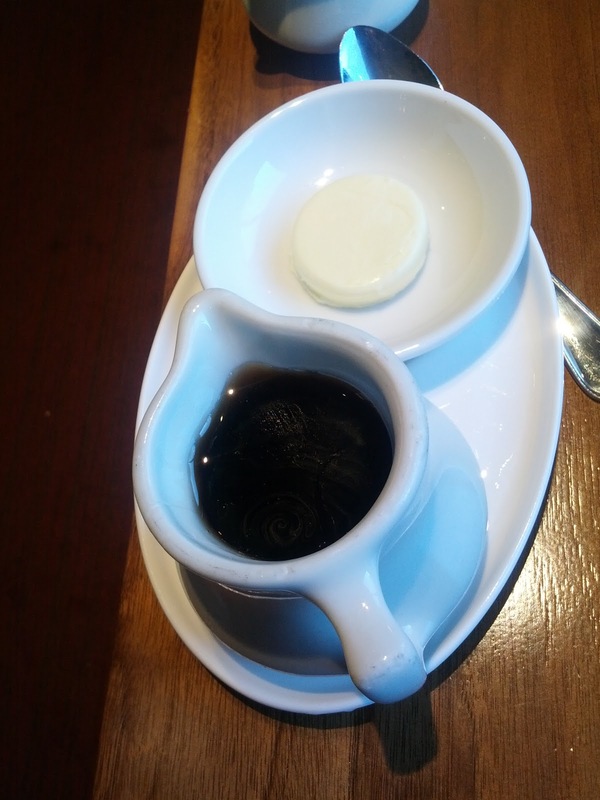 On the side I received warm syrup and butter, brought to me long before my meal arrived. 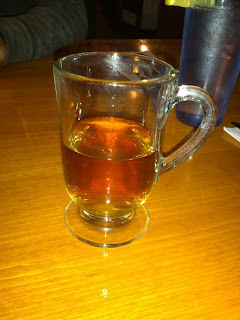 I loved the gesture of the warm syrup, but it was cold by the time the food arrived. It also had a really strange film on top. This was Ojan's pick, a simple bowl of oatmeal. It was unremarkable, which I guess isn't a bad thing. He said the consistency was good, which is about all you can hope for from basic oatmeal. It seemed like the exact same oatmeal that they had on the buffet. 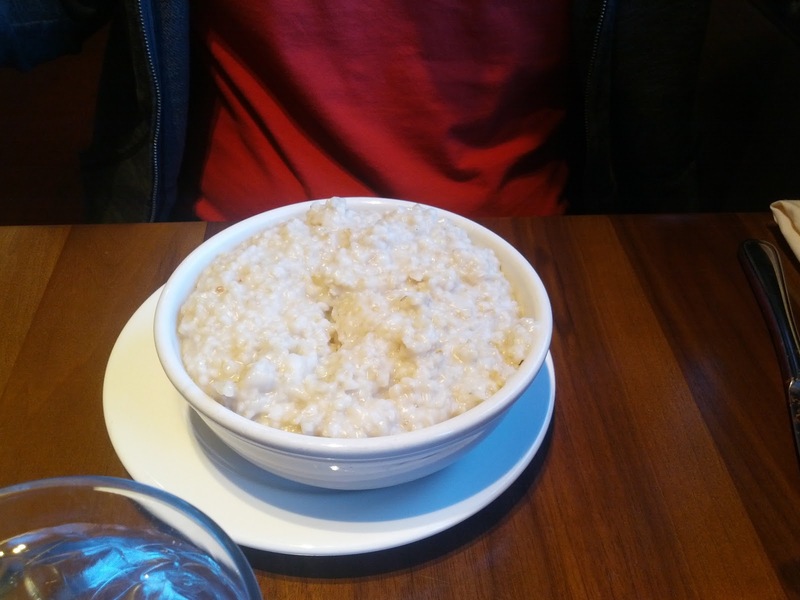 $9 is a lot for a bowl of oatmeal, but this was a huge bowl. Ojan didn't come close to finishing it. I kinda can't imagine that anyone could. Unlike my luke-warm food, his oatmeal was piping hot. Too hot actually, as he had to wait for it to cool down before he could eat it. 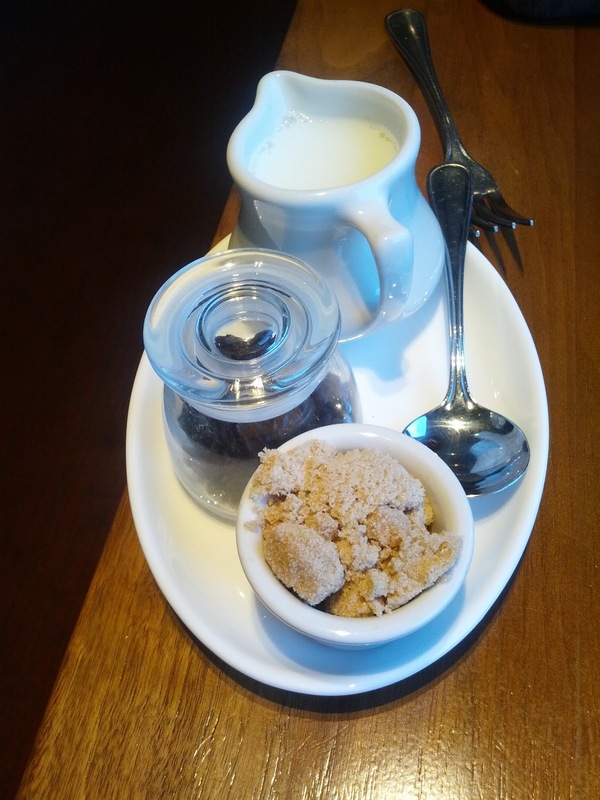 The sides for his oatmeal were a little pitcher of cold milk, a container of hard raisins, and brown sugar. The breakfast buffet had a much better selection of oatmeal mix-ins. That said, the a la carte menu also had two other varieties of oatmeal you could select from, one had peanut butter and chocolate, and the other ... ham, eggs, veggies, and cheese. I still really wish he'd ordered that one, as I can't really begin to imagine what it was like, but he went for the classic version. Bircher Muesli: oat and wheat grain, hazelnuts, milk, honey, preserved cherries. $8. When I lived in Australia for a few months, I became obsessed with muesli. My love for it all started on my very first visit to Australia, when the hotel breakfast buffet had it. I was hooked instantly. It was creamy, sweet, and full of delicious mix-ins. Every place I went in Australia seemed to offer it, and I ordered it over and over again. I loved it just about everywhere, ranging from hotel breakfast buffets to nice cafes to even the airplane. Why on earth do we not have muesli here in the US? Anyway, I was so excited when I saw it on the menu. And I remembered that my first time having it was at a hotel, so I thought it would be great. You can guess where this is leading. Sadness. It was basically just cold oatmeal with milk. I found it really strange that it had no yogurt nor apple mixed in. I didn't find any hazelnuts as mentioned in the description, nor did it seem sweetened at all, I certainly didn't taste the honey. It did have some unmentioned raisins. But overall, just cold, flavorless, mush. The preserved cherries were a bit tart, a bit sweet, and were at least something to mix in. Like the oatmeal, it was a huge serving, far more than anyone could realistically eat. A decent value I guess. I did like the leftovers more the next day when I had them at home, as it seemed to have soaked up the flavors a bit more, plumped up the raisins, and I added a bunch of fresh fruit and yogurt to it. Still, I would not get again. Torrefazione Italia Decaf Coffee. $4. I really wanted a warm cup of coffee with my french toast. I was expecting a sweet, decadent breakfast, so the idea of a bitter coffee to balance it out sounded perfect. For $4, I thought I must be getting a french press, so I was a bit surprised when a mug of coffee was placed in front of me. I took one sip, and almost spit it out. It was absolutely horrible. Bitter, acidic, just horrible, horrible. I added a ton of cream and sugar, and tried to enjoy it. Or really, tried to gulp it down quickly, hoping that a refill would come, and it would be better. The coffee had clearly been sitting for a very long time. I shutter to imagine how old it was. When my french toast arrived, my mug was empty, but no refill was offered. So I flagged someone down to ask for one. A different server came over with a carafe of coffee, and refilled my mug. This next batch was even worse, as it was cold. I guess in some ways, it did go well with my french toast, as neither were hot. Sigh. I mentioned the cold coffee to the server, who seemed to acknowledge my comment, but never brought any more in exchange. I finished my meal, still no coffee. I sat there waiting for Ojan to finish, as he was taking longer since his oatmeal was too hot to eat, so I drank the cold, horrible coffee. And flagged someone down to ask for another refill. Why I was even trying at this point, I don't know. I think I was just so disappointed, that I was desperately trying to get something good! Luckily, my last mug was actually good. The coffee wasn't horrible, and it was piping hot. But geez, for $4, the first two mugs were beyond bad, and Ojan pointed out that I wasn't paying for the coffee exactly, but more the service and refills, but uh, those weren't exactly free-flowing, as I had to actively ask for refills each time. The Breakfast Buffet. $22 per person. Buffets are one of my absolute favorite things. I love getting a chance to try a little bit of everything, and buffets are just about the best opportunity for that. At the same time, I also am a total food snob, get upset at cold food or food that has been left sitting in the pass too long before being delivered to my table, and I'm a total germaphobe, so loving buffets is also a bit odd for me. I guess more accurately, I love breakfast buffets, indian buffets, and dessert buffets, but find dinner buffets to be awful-tastic. Some things just do much better in a buffet setting than others. Anyway. Breakfast buffets. Love them. Sierra Cafe has a very extensive buffet. I walked around in circles for a few minutes just taking it all in, trying to decide where to start. So many options! The buffet started with basic cold items, like sliced fruit (including watermelon, so I avoided that whole section), whole fruit (bananas, apples, etc), and cereals. The cereal setup was a bit strange, as there were big serving bowls of different cereals along with carafes of milk, but then there were also individual packages of cereal and individual cartons of milk. Since it was a buffet, it isn't the sort of thing you'd get to-go, so I'm not sure why they had both. Anyway, an insane selection of cereals, something to satisfy those who wanted sugar cereal or healthy cereal. I didn't try any of it. Then there were some pre-assembled yogurt parfaits, along with yogurts, granola, and toppings to make your own parfaits. All pretty basic, but they had berries that were a nice touch during wintertime. The cold section also included a few assorted cheeses, meats, and spreads, along with a variety of breads and a toaster. I was excited to see smoked salmon, but it turned out to be really oily and I didn't like it at all. And there were bagels, pre-sliced. The bagels were actually quite good, and came in a variety of flavors. I had a blueberry bagel, which had a nice chew to it, and plentiful blueberries. They didn't taste like generic grocery store bagels at all, and I was pleasantly surprised. Unfortunately, the only cream cheese option was little pre-packs of Philadelphia cream cheese, which I never like. At least have the whipped version! The buffet also had some basic hot items, which the snob in me avoided like the plague: scrambled eggs, bacon, sausage, pancakes. I did try out two of the hot items: the breakfast potatoes and the carmelized apple crepes, both of which I wished I'd avoided. I should know better! The potatoes were kinda cold, and were just some sliced potatoes with a bit of seasoning. Meh. The crepe was super mushy, but the apples were well cooked, nicely caramelized, and quite tasty. Nothing like the ones served alongside my french toast. Then there was also the oatmeal, which seemed to be the same as what Ojan ordered a la carte, although it had a very impressive toppings bar including all sorts of dried fruits and nuts, but also huckleberry sauce, stewed fruits, etc. I added a bunch of these toppings to my parfait. Now, at this point, I haven't really expressed liking anything, yet I told you at the start that I loved the buffet. So ... what's missing? The baked goods, of course! The entire center aisle of the buffet was baked goods. They didn't necessarily look like anything special, but some turned out to be pretty great. First, there were donuts - plain, powdered, cinnamon-sugar. I actually skipped those, but I appreciated that they had such classic items. Then, there were a variety of muffins. They were all huge, and very moist. I didn't love any of them, but they were far better than most hotel or even cafe muffins. I started with one I could easily identify: lemon poppyseed. It was fairly moist, with a slightly crisp top, and strong lemon flavor, and nice crunch from the poppyseeds. But I realized I don't really like lemon poppyseed muffins anymore. I used to love them when I was a kid, but I haven't liked any that I've had recently, so I don't think it was Sierra Cafe's fault. Next I was drawn in by one with some streusel on top. It turned out to be apple. The apple flavor was good, and it was really moist, but it wasn't really my thing, and the streusel was kinda meh. Ojan ended up devouring this one after I discarded it though, so he liked it. I finished with one that turned out to be really intriguing: a fruit carrot walnut muffin. It was really hard to know what it was, as none of them were labelled (I looked up their muffin choices online afterwards to identify it!). It was loaded with really plump, juicy raisins. It was incredibly moist. The base flavor was a bit lacking, and the carrot was visible, but I didn't really taste it. It also had chunks of nuts. There was a lot going on. Not bad, but not great, my favorite of the muffins. The centerpiece of the baked goods display was a giant thing of cinnamon rolls. Buttery, moist dough, tons of cinnamon and sugar, insane amount of glaze. I went back for more 3 times. They were really good, although they turned out to be only my third-favorite item. They would have been mind blowing if served were warm. Next, I moved on to a scone. I had no idea what kind it was from looking at it. It turned out to be a savory jalapeño cheese scone. It was delicious! A nice kick of heat from the jalapeño, a ton of cheese, nicely balanced. Great texture, not too crumbly. Way better than the average scone! My second favorite of all the buffet items. Yes, I picked a savory item as a favorite! Which leads me to my favorite item: the raspberry danish! This was really good. Crispy croissant-like dough, a bit caramelized, and then filled with sweet raspberry preserves, drizzled with icing. It was sweet, decadent, and huge. I took a few bites, loved it, but couldn't imagine finishing it, since it was the last thing I had, and I was ridiculously full. Yet somehow, I ate the whole thing, after having everything else on the buffet too. I may or may not have considered going to get another one. I'm sure I would have regretted it, but I do still have a bit of remorse over not having another. Like any good hotel breakfast buffet, it also included a made to order eggs/omelet station. As I have one of these at work and I'm pretty sick of omelets, I didn't try it out. But for those who do not have regular access to this sort of thing, I think it probably is a nice touch. I learned after the fact that you could also order fresh waffles, delivered to your table when they were ready. I wish I'd known, as I love waffles! Next time! The buffet also included juices that were located on the buffet line, and coffee and tea that we could order at the table. It was the same as what the a la carte folks got. $22 per person is a bit pricy, but this was an all you can eat hotel breakfast buffet, so the price seemed pretty standard, particularly if the coffee alone is normally $4. I certainly ate my share, although Ojan only had some oatmeal and a few of my discards. Once tax and tip were added, the bill for two of us for breakfast was >$50 though, which is a bit crazy when you think of it. Anyway, I'd gladly get the buffet again, just for the baked goods. It really put other buffets, and even cafes, to shame. If I needed breakfast baked goods catering in the area, I'd certainly order from them. I recently spent a few days up in Tahoe, enjoying the beautiful scenery and skiing for the first time in about 10 years. It was a lovely trip, albeit not for the food! I've never thought of Tahoe as a culinary destination, and my experiences this past trip continued to solidify that view. Since my visit to the east coast last summer, I've been craving fish and chips. I had some spectacular ones there! 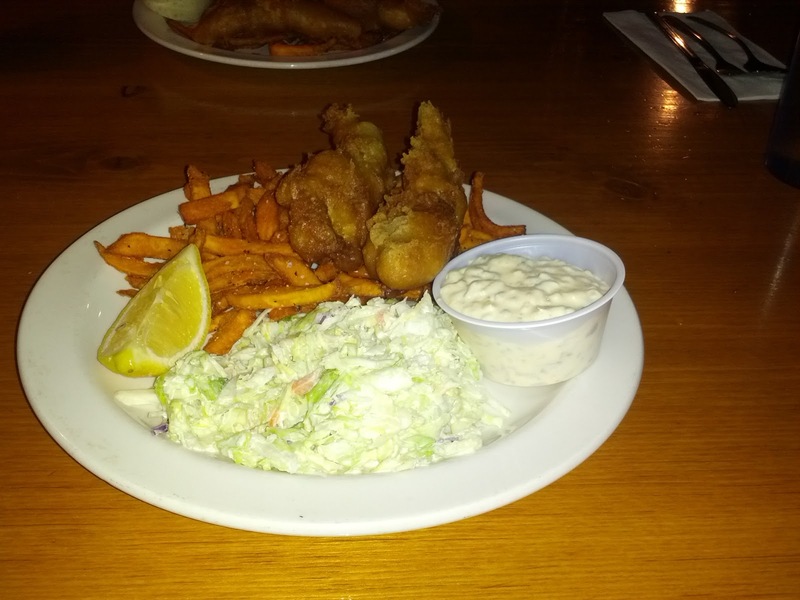 I haven't found anywhere near San Francisco with fish and chips that I've really liked, so I was excited when I discovered Wild Alaska, a seafood restaurant in Incline Village that featured fish and chips, with haddock even! I figured it was worth a try. The restaurant was on Open Table, so I made a reservation in advance. It turned out to not be remotely necessary, as the place was nearly empty when we arrived at 6:30pm on a Friday. It was a very cute, cozy restaurant, with a big wooden bar, a fireplace, and wooden tables. A rustic feeling bar and pub. The server was very friendly, but the food just really wasn't great. I won't be going back. Even though I grew up in NH, San Francisco has ruined me, and I was freezing. 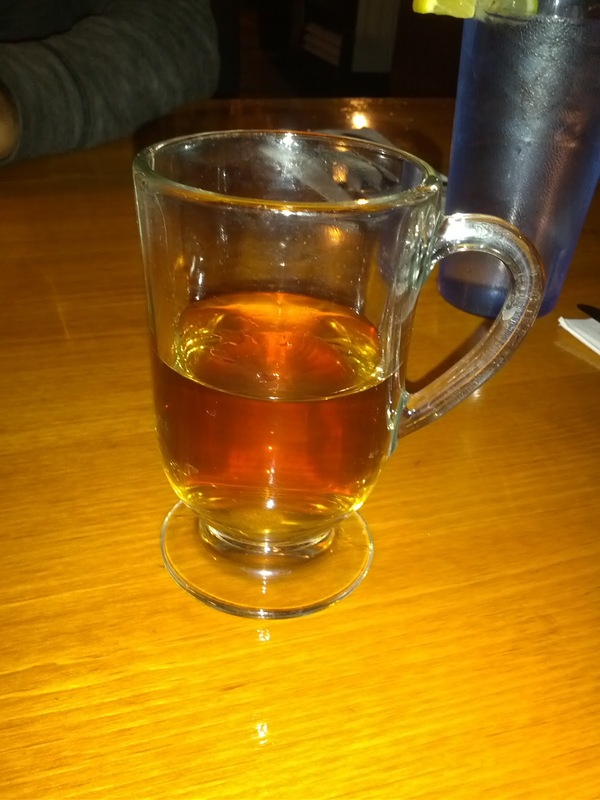 I opted to start with a warm apple cider. The price was $4 (I think, maybe $3.50?) so I thought it was going to be something besides a packet of powder stirred into hot water. I thought wrong. It was warm, and did the trick, but it was really watery and just crazy sweet and not very good. The price was way too high for what it was. Beer Battered Fish 'N' Chips, Sweet Potato Fries, Wasabi Coleslaw, Tartar Sauce. $16.99. Next we moved on to the Fish 'N' Chips. We had the choice of Coho salmon or haddock. Even though the place is "Wild Alaska", I opted for the traditional haddock rather than their salmon, as it was what I was craving. It was battered with an Alaskan IPA beer. The portion pictured is actually a half portion, as we weren't starving, and opted to split a meal. I'm very glad we did, as this was totally large enough for a meal, and I can't imagine the full size portion! The half portion was 2 large pieces of fish, a giant pile of fries, an even bigger pile of coleslaw, and a vat of tartar sauce! The fish didn't taste particularly fresh, the batter was very heavy although flavorful, but just far too oily. I absolutely hated the tartar sauce. I love tartar sauce, so this made me very, very sad. I'm not sure what it was, there was just something in the taste that I couldn't stand. The dish normally comes with wedge fries, but we upgraded to sweet potato fries for an additional $2. They were ok, a bit soggy, and without much real sweet potato flavor. Not horrible, but not very good either. I normally love dipping my fries in the tartar sauce, but since I hated the tartar sauce, I had to look for alternatives. Luckily there was honey on the table, so I created my own honey dip that went nicely with sweet potato. Finally there was the wasabi coleslaw, that all of the reviews I read previously raved about. It was ... unremarkable. Creamy enough, not too mushy, and it had some slight kick from the wasabi, but overall just wasn't really special. Overall, this was all just very mediocre. It was a large amount of food for the price, although they added an additional $1.50 fee for sharing an entree (which seems to be pretty standard practice in the area, with fees ranging from $1-$3 typically). I don't mind the charge at all, as it does make sense since the kitchen is doing extra work to split it, and sometimes they include more of the side when they split, etc, but the fee was NOT listed on the menu, and when we ordered the dish, it was also not mentioned. You've probably run into Coriander Gourmet Thai before and just not realized it. They have a couple locations in San Francisco, one in the Westfield mall, and one just a block away in the new Metreon. Yes, they are mall food court food, yet they brand themselves a "Gourmet Thai" establishment. They are always eager to give you samples, and as I do like Thai food, I've tried them out a few times. Unfortunately, their name can't disguise the fact that they are serving low quality, overly sweet, just not good Thai cuisine. There is nothing gourmet about it. I haven't found any of their food to be remotely worth getting. The drinks are better than the food, but are also just way over-sweet. At least they are on LevelUp, if you want to enjoy some free credits for your very mediocre thai? 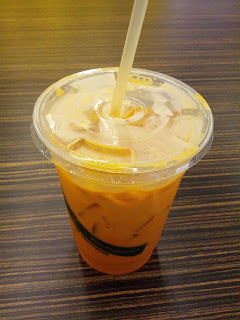 Fairly generic Thai iced tea. Sweet. Decent enough if you are in the mood for it. I wasn't entirely sure what to expect from this. 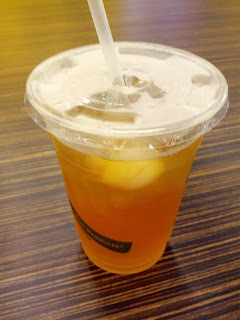 Black tea, with some lychee flavor? It was insanely sweet. Sweeter even than the Thai iced tea. I had to wait for some of the ice to melt and dilute it to really make it drinkable. And I like sweet things. In the future, I'd ask them to water it down a little. Once I got past the sweetness, I did like it. It had a lovely lychee flavor. It also had two whole lychees in it, which I was originally very excited by. I saved them until the end, and eagerly bit into them. They were nasty. Hard. Bitter. Gross. Do not eat them! Overall, this was fine, but not really worth $2.95. I'd consider it again if I wanted a really sweet, somewhat refreshing, caffeinated drink. Sweet Tofu with Crispy Basil: Poorly fried tofu in boring sweet sauce. Eggplant Tofu: Incredibly oily chunks of flavorless eggplant, poorly fried tofu. Pad Thai: Sweet, poorly cooked mushy noodles, mushy sprouts. 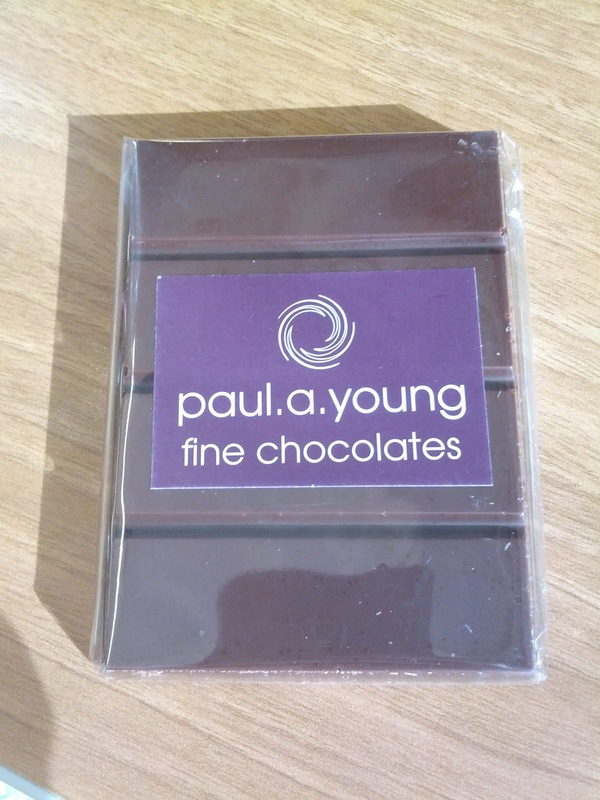 A friend recently returned from England, and came back bearing a great gift: chocolate! Unfortunately, I wasn't a fan of the varieties I tried. 100% Madagascan. Single origin. Tasting notes: Wow. This was intense. Bitter, tart, made my face pucker in a way that no chocolate ever has. Very chalky mouthfeel. Emil noted some herbal qualities, perhaps thyme. 64% Papua New Guinea. Single origin. Tasting notes: Very hard to bite into, but not a pleasant snap. Incredibly fruit forward. Chalky mouthfeel that I did not like. Some grittiness.